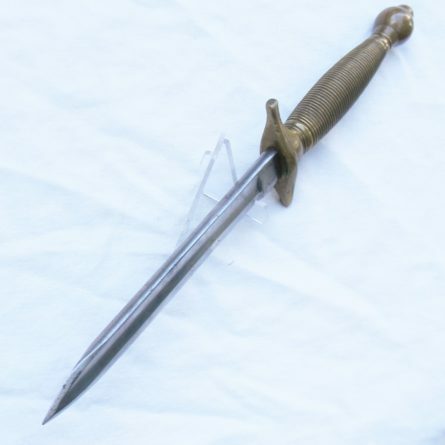 Rare American Civil War era Fighting Knife M1840 NCO Sword originally manufactured by C. Roby of West Chelmsford, MASS. 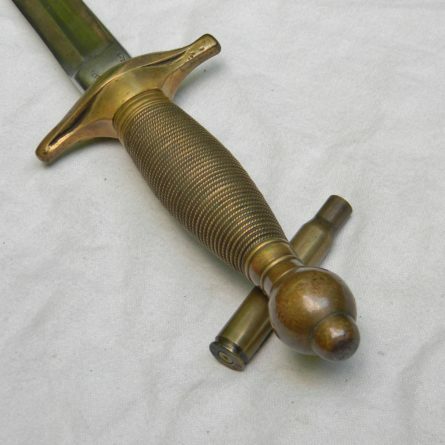 Solid cast bronze handle, ricasso marked U.S. / 1863 / F.S.S. 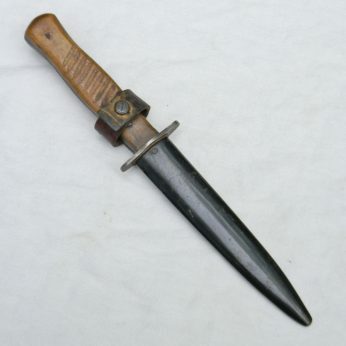 One of a kind American Civil War era improvised fighting knife made from a broken US M1840 Non-Commissioned Officer’s Sword and re-tooled / re-sharpened as a dagger. The original M1840 sword was manufactured circa 1863 by Christopher Roby of West Chelmsford, Massachusetts. 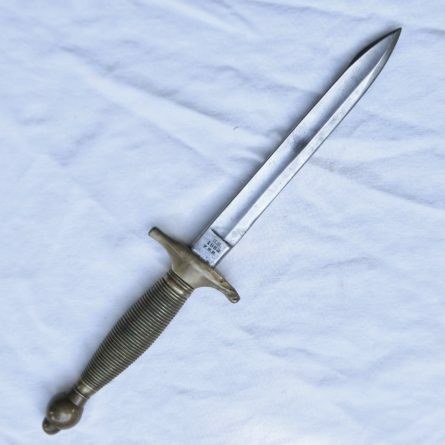 Generally speaking, these NCO swords were not meant to be personal defense weapons. 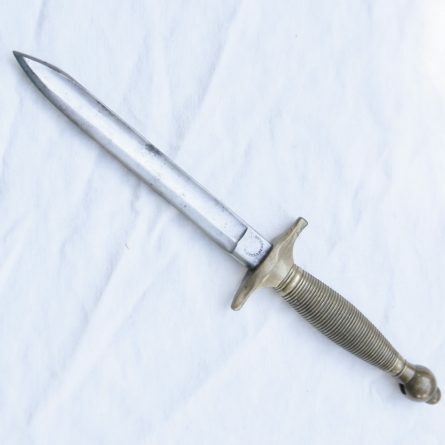 M1840 was designed to be mostly used as a dress sword, not to fight a close-quarter battle. 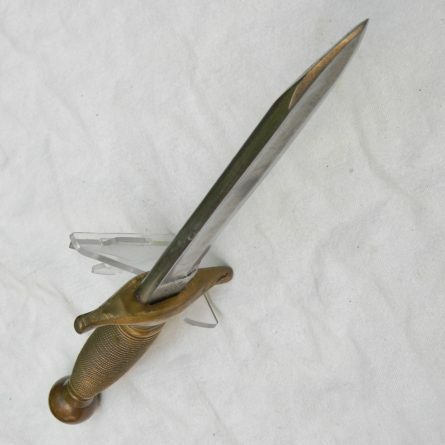 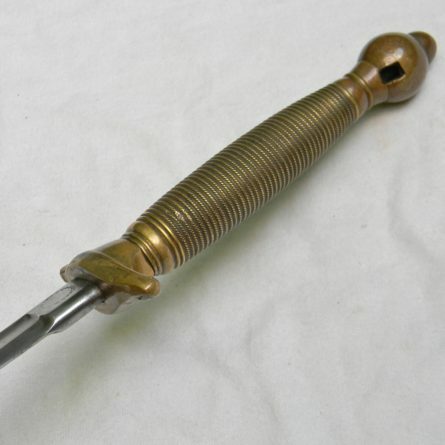 But during the Civil War a lot of captured or broken swords found a new life as fighting knives – as the war dragged on, the soldiers on both sides of the conflict found themselves without a reliable personal sidearm. 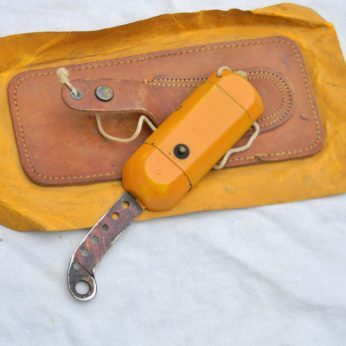 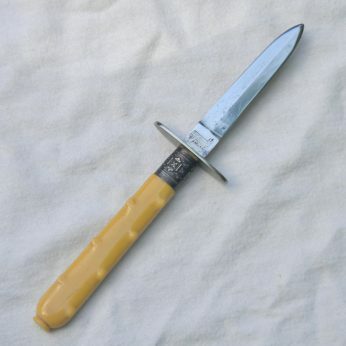 Anything that could be re-used as a camp knife and/or a fighting knife was put to use. 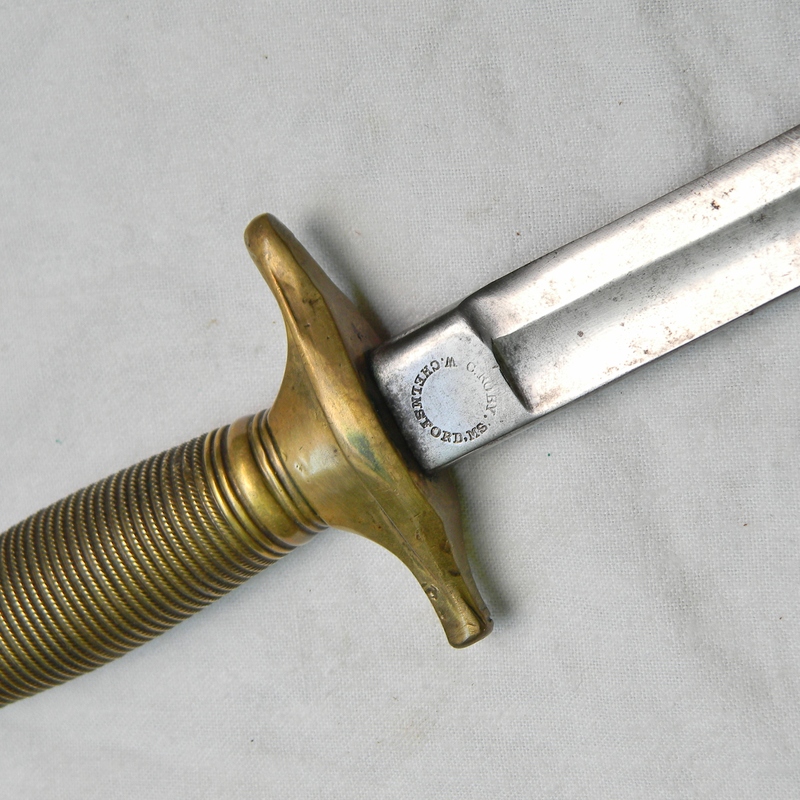 This re-tooled M1840 NCO sword is an example of one such “born again” sidearm. This particular specimen is in great overall condition: original cast bronze handle with wire pattern and wide crossguard are in excellent shape with only a few contact marks and some tool marks on the guard where it was chopped-up and filed. 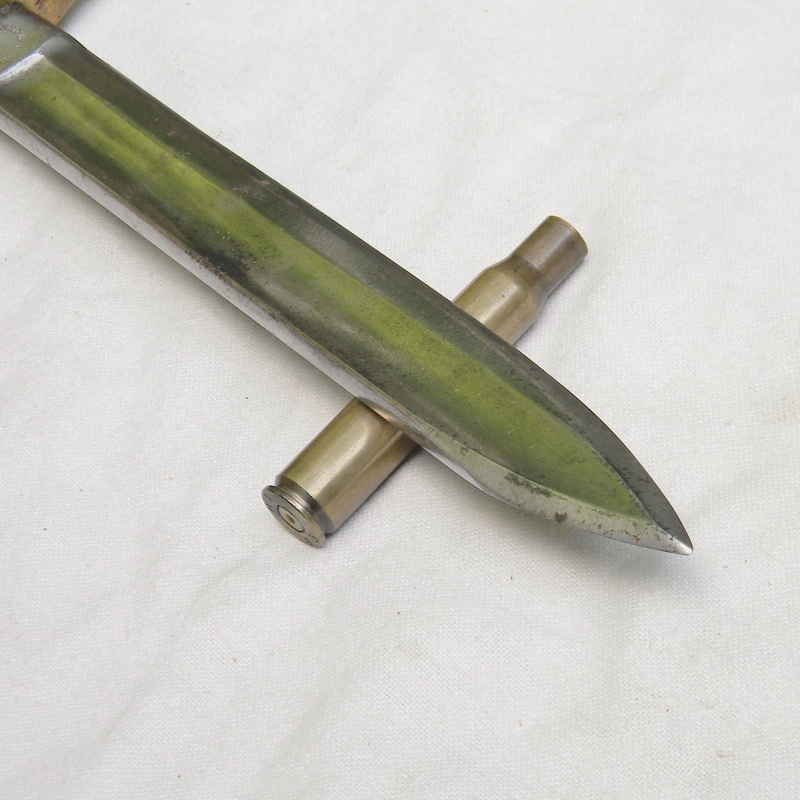 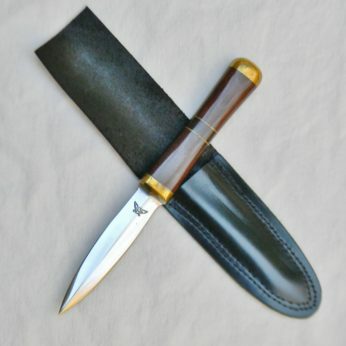 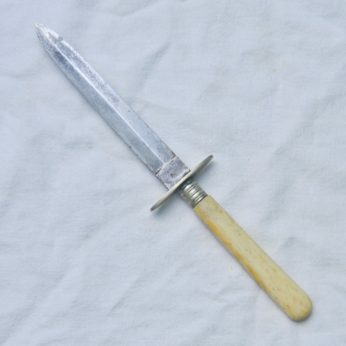 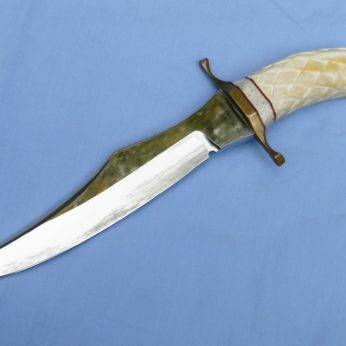 This fighting knife is about 13-7/7″ / 35.5 cm overall; fullered blade is about 7-3/4″ / 19.7 cm. 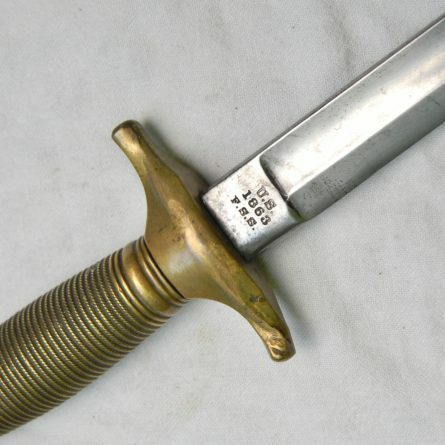 Ricasso is date-stamped U.S. / 1863 / F.S.S. 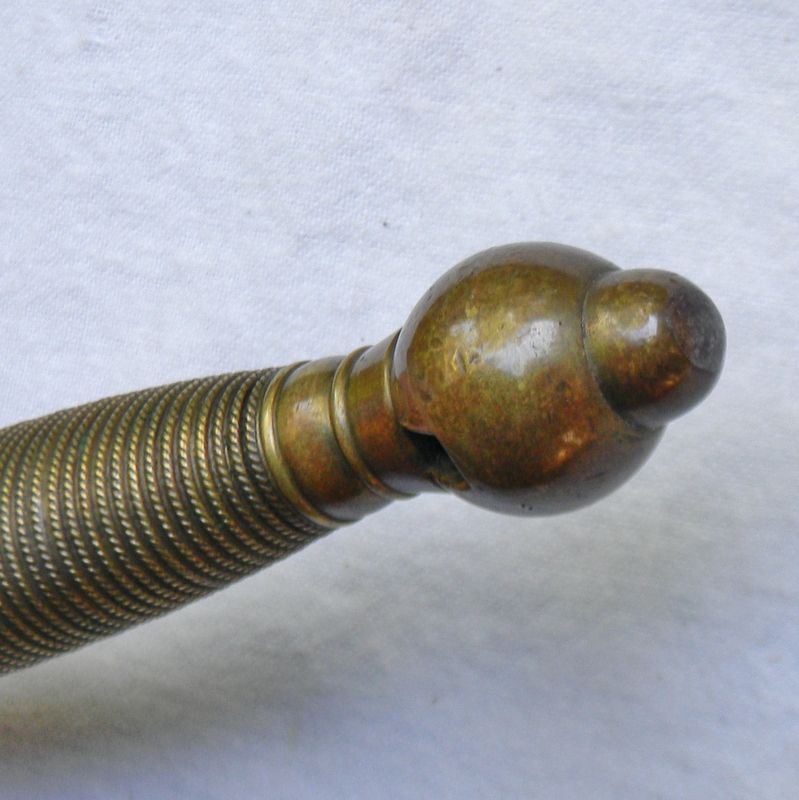 on one side and with C. Roby’s circular factory stamp on the other. 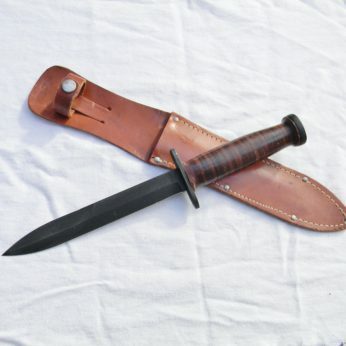 This bad boy weights 15.9 oz / 0.451 kg; there is no sheath. 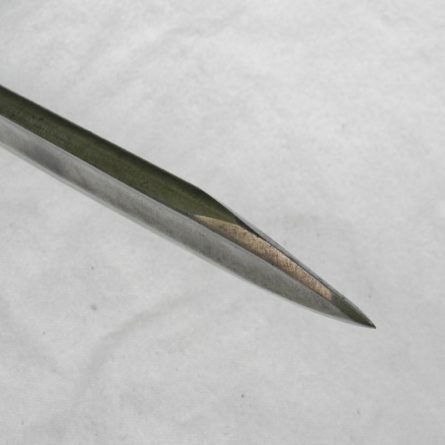 No pitting on the blade; the tip is undamaged; no edge nicks on the blade, scarce this nice. Over 155 years later, this antique American Civil War era Fighting Knife M1840 NCO Sword-turned fighter is still in very much serviceable condition; VERY rare this nice. 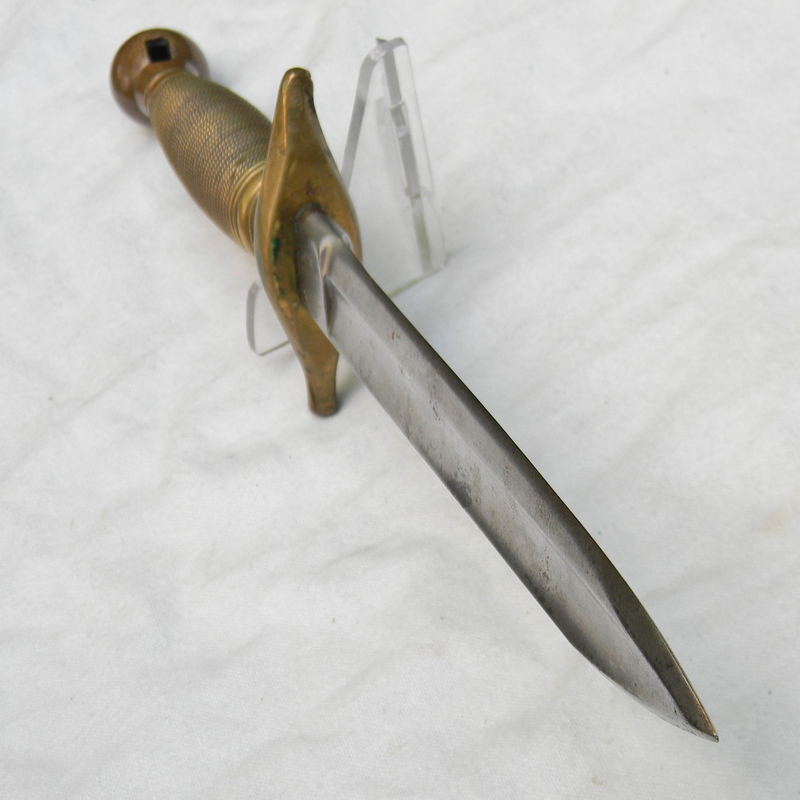 Most of the surviving Civil War era fighting knives are in private collections and rarely come up for sale; don’t miss your chance to add this gorgeous specimen to your collection! This American Civil War era Fighting Knife M1840 NCO Sword-turned fighting dagger has not been cleaned or tampered with in any way. 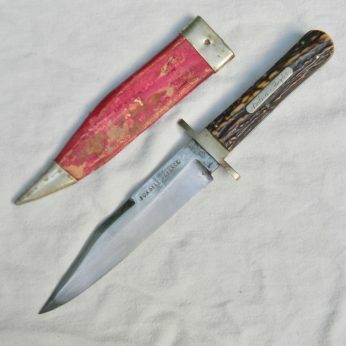 It’s in 100% original “as is” condition; these are the actual photos. 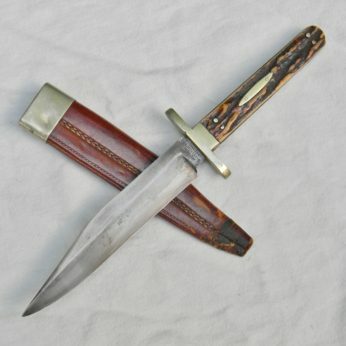 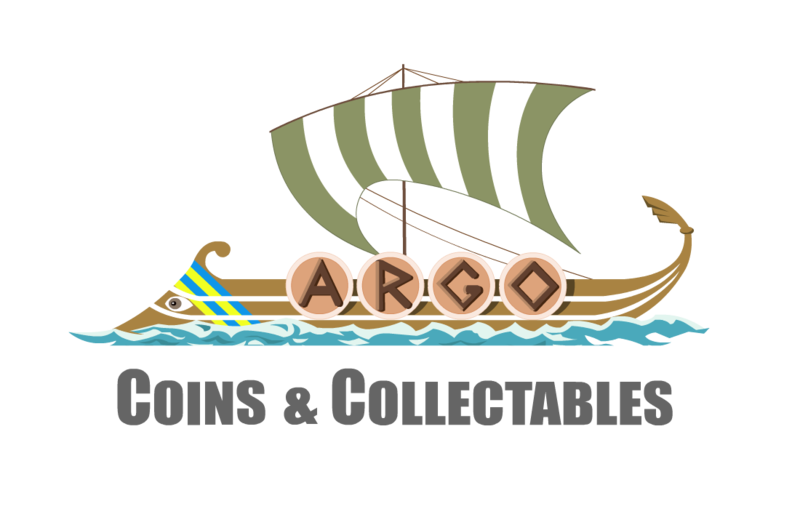 We have several vintage American and European knives available for sale – please check out our Collectable Blades section for similar listings.